Suffolk County Council is proposing to abolish its school lollipop crossing service with the loss of 62 jobs to save £174,000 a year. 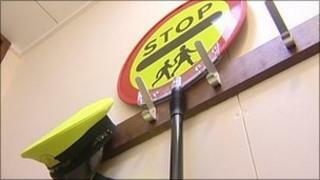 A letter has gone out to the lollipop men and women warning them their jobs will go if the proposal is passed. Some schools have already lost their crossing staff and have made other arrangements. The council says it needs to save a total of £125m, with an immediate cut of £43m in the next financial year. Council-employed lollipop crossing staff have powers to stop traffic but those employed by schools are regarded as wardens who must wait for a break in the flow and usher the children across. At Horringer Court Middle School in Bury St Edmunds teachers take turns to see children safely across the road. Teacher Andy Price said: "Someone at the crossing is vital because of the volume of traffic. "Some child might be tempted to run out and one child hurt is one too many," he said. Nick Templeton at Westley Middle School in Bury St Edmunds said he had written to the county council for permission to employ a crossing warden directly but had not had a reply. "The traffic is quite heavy around the school. "We can take the money out of our budget. The school would lose out but the county council would get their cut," he said. The Department of Transport said that 809 children were injured or killed in accidents at traffic lights, pelican and zebra crossings in 2009 in England and Wales and 36 at patrolled crossings. A spokesman for Suffolk County Council said as it was a proposal to be discussed at a meeting this week it could not comment in detail. "The council must save up to £125m in the next two years, with an immediate need to slash nearly £43m from the 2011-12 budget," he said. In addition to the plan to abolish the lollipop crossing service one or two libraries could also close and some country parks come under the control of local communities.